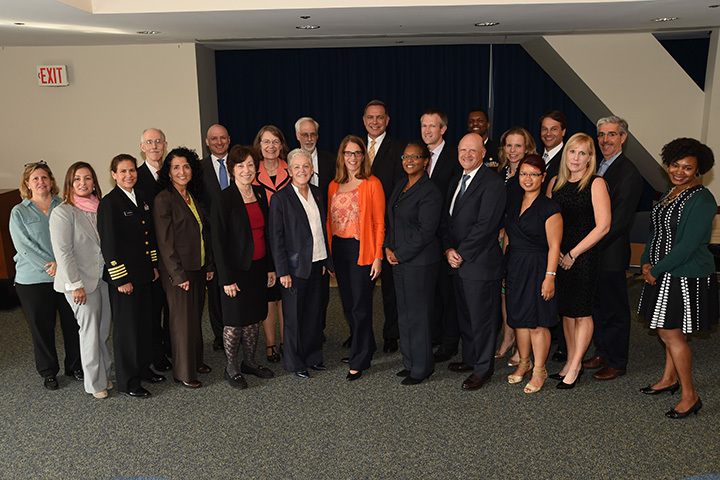 The President’s Task Force on Environmental Health Risks and Safety Risks to Children met Oct. 14 at the U.S. Department of Health and Human Services (HHS) in Washington, D.C., to review its accomplishments and recommit its members to continuing to work together to meet its goals. President Bill Clinton established the task force in 1997, by Executive Order 13045. 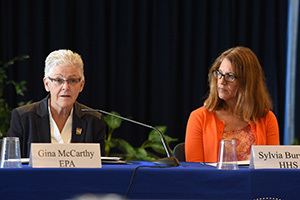 HHS Secretary Sylvia Burwell and U.S. Environmental Protection Agency Administrator Gina McCarthy, whose departments co-chair the task force, led the meeting of 17 federal agencies and offices. John Bucher, PhD, director of the National Toxicology Program Division serves as chair of the Chemicals Subcommittee and Kimberly Thigpen Tart, J.D., program analyst in the NIEHS Office of Policy, Planning, and Evaluation serves as co-chair of the Climate Change Subcommittee. Both helped plan the meeting and also attended. Other NIEHS staff regularly contribute to the Task Force Steering Committee. Identifying priority risks and issues. Recommending and implementing interagency actions. Communicating information to decision makers for use in protecting children’s environmental health and safety. Achievements of the task force include development of a Coordinated Federal Action Plan to Reduce Racial and Ethnic Asthma Disparities. The action plan aims to reduce the burden of asthma in minority children and those with family incomes below the poverty level. Other achievements include identification of cross-agency biospecimen resources, to support measuring children’s chemical exposures, and consulting on the impacts of climate change on children’s environmental health, to inform a U.S. Global Change Research Program Climate and Health Assessment. A new work plan to guide the group’s efforts over the next year and into the future is in development and should be finalized by early next year. Communicating the risks of climate change to the public and the benefits of new pesticide regulations to teen workers. Exploring ways to encourage sustained funding for programs that address asthma disparities. Making use of new environmental monitoring and exposure data efforts to better characterize children’s health risks. next article - "Roadmap for replacing rodents ..."